The people looked around and saw and heard things that were confusing and even a little frightening. Unknown to most of them on the street, a jarring wind had moved through a house nearby, and a strange but not consuming fire had appeared. These odd God-driven events changed the people who were praying in the house. As they went out into the street they could suddenly speak so that those on the street could hear in their own languages. Their languages were many, because people had come from far and near to Jerusalem for an important festival. Before they knew it, they were surrounded by disciples of Jesus who spoke so that everyone could understand. Justifiably those on the street then said to one another, “What does this mean?” Such were the powerful events of Pentecost, when God’s Spirit was poured out upon Jesus’ followers. I know that some of you are wondering this now, as you’ve heard the news about Pastor Tammy leaving, and a new Associate Pastor being appointed. In the United Methodist Church, pastors are appointed to serve by our Bishop. We entrust our lives to that service when we are ordained, and agree to itinerate, to go where we are sent. In that pastor trust that God will give us what we need, and that God will care for the pastoral leadership of churches. It requires a lot of trust in God’s work in our lives and in the world. “What does this mean?” For us right now it means that we trust that God is already preparing the next ministry for Pastor Tammy, so we pray with her and Jack as that is made known to them. It also means that we have the privilege of welcoming Pastor Stuart Salvatierra as our new Associate Pastor, and have the chance to both be blessed by his gifts and help him grow in ministry. Like Jesus’ followers on that Pentecost day, we open our hearts to welcome God’s Spirit and power in the midst of change. 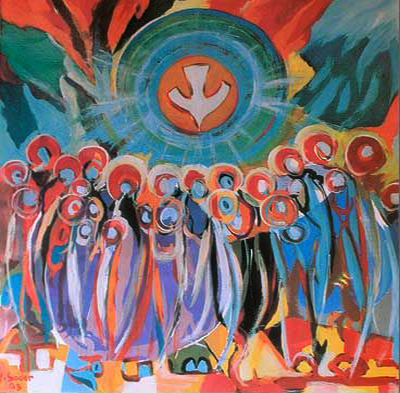 By now you’ve realized that this Sunday, May 20, we celebrate Pentecost. The color of Pentecost is red, for that fire and power of God’s Spirit. My prayer is that God’s joyous, inspiring power and strength will be poured out once again this Pentecost day. P.S. We also recognize graduates this Sunday, May 20.